glad to see some progress from WV. I’ll never tire of the wormy chestnut. What is this project, and who is Bertha? Wait, I remember that guy. Used to hang around on the Handplanes thread, right? And wormy chestnut… I have a few scraps of that stuff in inventory that came from West Virginia! 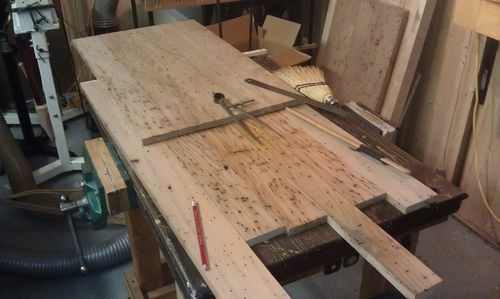 Throwing us a bone of progress on the linen press, actually getting shop time! Sweet! This cabinet is gonna have all kinds of visual interest, I think. Looking forward to some larger assemblies, exciting times to come. Congrats on progress! Found any worms yet then? Nice to have you back Al and great to see some progress on the linen press. I’m off to find out what a linen press is now, ‘cause whatever they are, we don’t have them here. Looking good Al!! If you come up short, I have a few small pieces of wormy chestnut I’ve been holding on to for a long time. Not really sure what to do with them, so if you need em….. He is back…the press is back. Hope all is well. Looking good, Bertha. That chestnut is so beautiful. Good looking wood…. I had to look up and see what a linen press might look like. I thought it was going to be a table of sorts with some apparatus that flattened sheets… or something. Now I know. 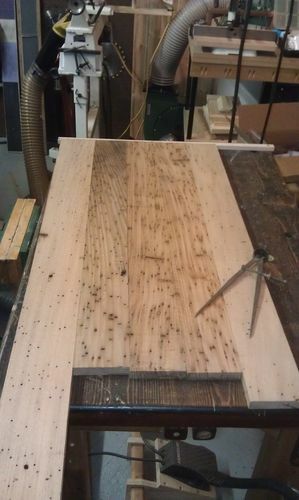 Looking forward to seeing the finished piece with this particular wood. Yea Al, I know what it is, but we’re gonna need an explanation of why it’s called a press. I don’t know what a linen press is Bertha, but I love the wood. Do you have to train the worms or are they just naturally creative (destructive?). Looking forward with suspense what this eventually turns out to be. I’m sure it will be nice since you are building it. Great to see some progress Al! Good to see some activity in WV. Now I also need to look up linen press. All the guys above claimed to have looked it up but I wonder about them since they didn’t share the findings. LOL Good to see your post. here they are for all to see.